High-speed copper broadband technologies such as ADSL and VDSL are still common in emerging markets. 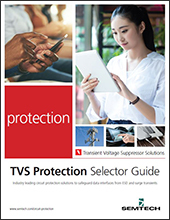 These interfaces need high-performance transient voltage protection to adequately safeguard them from ESD and Lightning induced transient threats. Semtech’s industry leading low-clamping performance and innovative packaging provide advanced performance solutions to safeguard xDSL based communication systems from transient voltage threats.